Gold Price Breaks Lower – What Next? The Technical Traders Ltd. research team has been on top of nearly every move in the metals markets over the past 12+ months. On February 1, we posted this article: Get Ready For The Next Big Upside Leg In Metals/Miners. In this post, we suggested that the recent peak in Gold, near $1330, would likely end and prompt a downside price rotation over the next 45+ days. Subsequently, on January 28, we posted this article: 45 Days Until A Multi-Year Breakout For Precious Metals. In that post, we highlighted our predictive modeling systems support of a sideways price correction in the precious metals markets that would align with US stock market strength and US Dollar strength. Today, the price is moving in favor to confirm that our modeling systems and research is correct again. 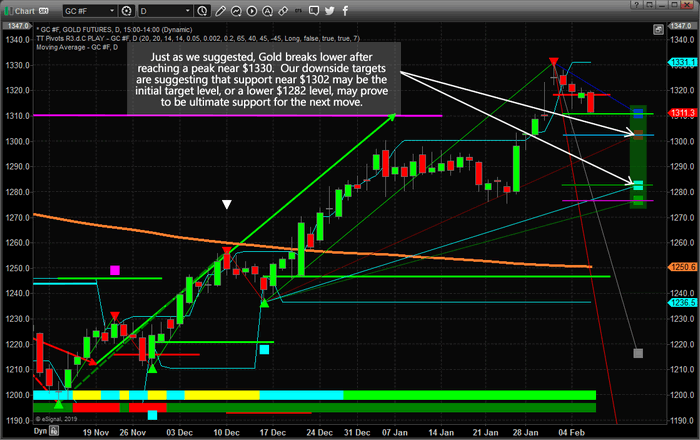 Gold has recently broken lower, below $1315, and appears to be targeting our lower Fibonacci projected target levels. At this point, we believe the Fib level near $1302 will offer minor support and the lower level near $1282 will become major support. We believe the psychological level at $1300 will be tested and broken over the next 30+ days as rotation above $1275 continues to play out. Remember, if our analysis is correct, Gold will provide multiple excellent buying opportunities over the next 30+ days for skilled traders to prepare for the larger upside move. We believe the downside price breakdown is aligning with general US stock market and US Dollar strength that should last until near the end of March or early April 2019. We believe a moderately deep price rotation in precious metals will allow skilled traders to accumulate positions below $1285~1290 in preparation for the upside breakout move. Read the articles linked above to understand why this is so important for all traders to understand. The next 2~4 months of trading activity are critical for all investors to understand the dynamics of what is at play across the global markets. Our research suggests we have about 45 days of moderate calm before precious metals begin to breakout to the upside. If you understand the importance of this move, then you’ll understand WHY you need to be prepared for this to happen. Want to know how we can help you prepare for and profit from these moves? Do yourself a favor and read the free research of our proprietary predictive modeling systems, cycle modeling system, and Fibonacci price modeling systems. These incredible tools we use help our members stay well ahead of these market moves www.TheTechnicalTraders.com/FreeResearch to read all of our public research posts. Don’t wait till it’s too late for this one. Take a minute to see why you really need to consider having a skilled team of traders and researchers backing you up every day. 2019 is already proving to be a great year for our members as we recently locked in 10.5% with an ETF, and another 8% on stock, and we would love to help you achieve greater success this year as well. Disclaimer: Nothing in this report should be construed as a solicitation to buy or sell any securities mentioned. Technical Traders Ltd., its owners and the author of this report are not registered broker-dealers or financial advisors. Before investing in any securities, you should consult with your financial advisor and a registered broker-dealer. Never make an investment based solely on what you read in an online or printed report, including this report, especially if the investment involves a small, thinly-traded company that isn’t well known. Technical Traders Ltd. and the author of this report has been paid by Cardiff Energy Corp. In addition, the author owns shares of Cardiff Energy Corp. and would also benefit from volume and price appreciation of its stock. The information provided here within should not be construed as a financial analysis but rather as an advertisement. The author’s views and opinions regarding the companies featured in reports are his own views and are based on information that he has researched independently and has received, which the author assumes to be reliable. Technical Traders Ltd. and the author of this report do not guarantee the accuracy, completeness, or usefulness of any content of this report, nor its fitness for any particular purpose. Lastly, the author does not guarantee that any of the companies mentioned in the reports will perform as expected, and any comparisons made to other companies may not be valid or come into effect.